The best gift to get anyone at any time is the Nomader Collapsible Water Bottle. This easy to carry and clean bottle is perfect for people on the go who want to stay hydrated and feel good. This silicone water bottle easily folds up, but stays hard and sturdy and you need it the most. Foldable, leak proof and durable, it’s the perfect bottle for hikes or other activities. Made of flexible, shatterproof silicone, Nomader bottles are tough enough to survive those accidental drops and is made with 100% health safe materials, free of BPA, BPS, phthalates, and other harmful leaching chemicals. It has a lifetime warranty and will not collapse while drinking from it. What’s better than that? To find out all the amazing qualities this simple bottle has, check out their website. 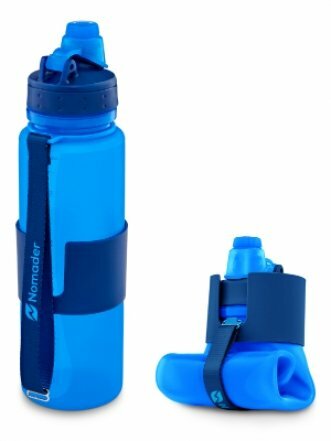 The Nomader Collapsible Water Bottle comes in a dozen different colors and starts at just $21.95. You can also get it on Amazon, today!